Question: How do I start or stop receiving the Unprocessed Submissions Report email from FileTime? Answer: That email is sent, by default, to all firm eFiling administrators in each firm. If you do not wish to receive this report, use the following procedure to stop them. If you have previously stopped them and want to begin receiving them again, reverse the following procedure. Click the My Account button (A) on the top navigation bar. Click the drop down arrow on the Notification Preferences (B) button on the sub-navigation bar. 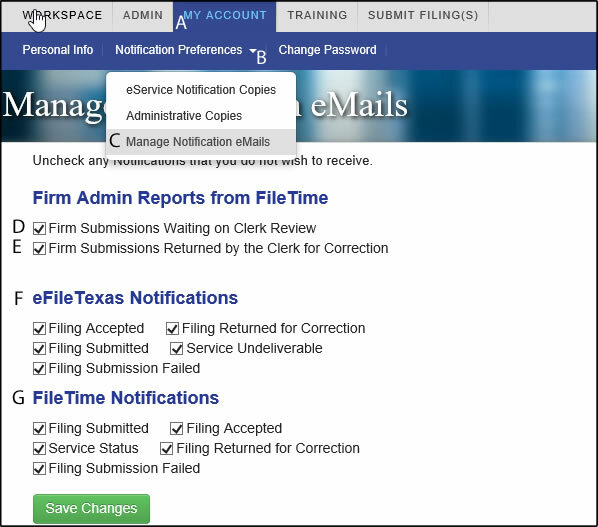 Click the Manage Notification eMails option (C) on the drop-down menu. Under Firm Admin Reports from FileTime, un-check the Firm Submissions Waiting on Clerk Review option (D) to stop receiving those eMails. Un-check the Firm Submissions Returned by Clerk for Correction option (E) to stop receiving these eMails. Be sure to click the Save Changes button before leaving this page.